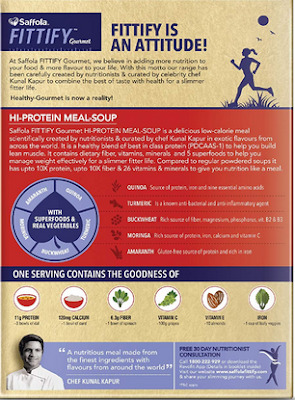 "With 5 plant-based superfoods - quinoa, moringa, amaranth, buckwheat and turmeric". All the right words to grab the attention of today's health-conscious, time-starved urban consumer, isn't it? Firstly, we need to understand these 10X protein claims. 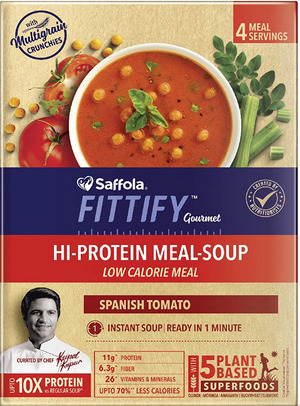 In tiny font, it is mentioned that 10X protein comparison is with regular powdered instant soups available in the market, the ones like Knorr that hardly have any nutrition. All I can think of is the classic Goundamani-Senthil dialogue - "naa ezhaavadhu pass nga, neenga SSLC fail nga...pass perusaa, fail perusaa?" (Folks who don't understand Tamil, this is a dialogue from a Tamil movie Gentleman). In other words, one who claims "I have scored 15 marks and I'm better than the student who scored 5 marks" when the pass percentage is 50% and the distinction percentage is 90%. Next, let's turn our attention to these superfoods. The back side of the pack states the benefits of these five superfoods to reinforce the fact that this soup indeed contains these magical ingredients. Now we need to know how much of these ingredients are actually present. Such minuscule quantities! How ridiculous is that! Since there are no regulations, brands can add a teeny tiny amount of any of these and use them in their promotions. As consumers, we need to be wary of such claims and really understand the quantity of these ingredients. The food bloggers promoting this soup are being sent a hamper with these superfoods in cute, little glass jars. Yet another visual fooling strategy used by brands to create a false image. Earlier, brands used to send only their product (and the exact phrases to be used) to food bloggers/influencers. Now they seem to be sending the appropriate props to use in the pictures. What are the top ingredients then? I haven't done enough research to share my thoughts on soy protein isolate, which is being widely used in protein shakes. What I have read so far is that soy protein isolate is chemically extracted from soy. Given that more than 90% of soy is genetically modified, I avoid soy products or its extracts. There are enough protein-rich sources in a traditional Indian diet. I don't see a need for such chemically processed protein extracts. The source of protein is mainly soy protein isolate. Quinoa, buckwheat and amaranth are protein-rich sources but given their quantities are so less, we are not getting protein from these natural ingredients. Maltodextrin is highly processed, artificially produced white powder, derived from starch. It is used as a thickener and binding agent in many processed foods. Our body absorbs it quickly, giving instant energy. It has a high glycemic index and spikes up glucose levels. It might be suited for athletes, but definitely not for someone looking to lose weight or managing lifestyle ailments like diabetes. Each serving contains 6.8gm of sugar (approx 1.5 tsp of sugar). What's the need for sugar in a soup? A pinch should suffice to enhance the flavor, why 1.5 tsp of sugar? Each serving contains a whopping 1189 mg of sodium. To give you a comparison, Knorr sweet corn vegetable soup contains 543 mg of sodium per serving. This is extremely high for a single meal soup.Why aren't the food bloggers talking about this fact? As usual, this soup also uses the term "real vegetables". If you check the ingredients list, it is a measly 1.3% of dehydrated vegetables(tomato, onion, coriander and parsley). The soup is called Spanish tomato but there is hardly any tomato present. Artificial additives in the form of flavor enhancers (INS 627, INS 631) are also present. Yes, the same flavor enhancers used in Knorr soups. Please check my post on Knorr soups to know more about these flavor enhancers and their side effects. Apart from the soup mix, it also comes with "multigrain crunchies". Yeah, obviously....when you add "gourmet" to the name and want a premium positioning, there has to be "multigrain" in it, isn't it? What are these crunchies made of? Oat flour, corn flour along with a few other ingredients. And yes, the same 2 flavor enhancers (INS 627, INS 631) are present here as well. Each pack comes with 4 servings and MRP is Rs.375. Current selling price in Amazon is Rs.300. So each serving costs Rs.75. Quite a high price we are paying for hardly-any-good, mostly-bad ready-to-eat soup. There are other variants like Mexican sweet corn, Italian mixed vegetables etc. The ingredients are pretty much similar. And the same story repeats itself. Yet another junk masquerading as healthy, that is launched to fool urban consumers, curated by a celebrity chef. A bowl of healthy and tasty tomato soup can be made in 15 minutes with a 2-litre pressure cooker and a hand blender. The minimum ingredients needed are 4-5 tomatoes, 1 onion, 3-4 garlic cloves, butter/oil, salt and pepper powder. That's it, not a long laundry list of thickeners and flavor enhancers. You can skip the butter/oil and make it vegan, oil-free. If you want to add protein-rich foods to this soup, add a handful of moong and/or masoor dal, which will also give a nice, creamy texture without the need for any thickeners. If you want to make a nice moringa soup, here's my recipe, using real drumstick greens. You might need around 2 handfuls of the greens, not 0.004% as present in this pack of instant soup. All my homemade soup recipes are tagged in Instagram here. Do take a look, these are quick and simple. Let's stop relying on celebrity chefs to curate junk meals for us. Let's stop falling prey to tall health claims. Let's learn to cook and invest time in cooking every day for our good health. And yes, as always, READ THE INGREDIENTS LIST AND NUTRITION FACTS TABLE.